Directed by Xie Fei. 2000. 95 minutes. In Tibetan and Chinese with English subtitles. Reflecting on her abduction by the man who would become her husband and lifelong partner, Yeshe Drolma tells her granddaughter “It must have been my bad karma that fated me to be with him… Everyone’s fate is decided by Buddha…” thereby expressing an important theme of the film: the integration of religion into every aspect of Tibetan life. Song of Tibet (Yeshe Drolma in Tibetan and Chinese) features a young woman named Dawa, who leaves the metropolis of Beijing behind to see her grandfather in his dying hour. Dawa in a sense is a stand-in for us, the audience. Although Dawa is ethnically Tibetan, she lives a world apart from her Lhasa grandparents, whose love affair on the Tibetan grasslands began in 1950 and has managed to survive the twists and turns of Chinese politics, including the turbulent period of the Cultural Revolution. In a series of flashbacks, the elderly grandmother Yeshe Drolma tells Dawa of her first meeting with would-be suitor Gyatso, a wild man of the Tibetan region known as Kham, and their subsequent separations and reunions. Song of Tibet is based on a novel by the Tibetan author Trashi Drolma and is directed by the well-established filmmaker Xie Fei, who graduated from the Beijing Film Academy in 1965, just before the Cultural Revolution closed it down. Released in 2000, Song of Tibet was filmed almost entirely in Tibetan and is subtitled in Chinese and English. While the English subtitles adequately convey the plot, they occasionally omit interesting details. While the film is set in contemporary Lhasa , through flashbacks we are transported back in time back to the Tibetan countryside just after the founding of the People’s Republic of China in 1949. Song of Tibet is a distinctly Chinese film with a Chinese flavor, yet it contains none of the political dogma of Li Jun’s 1963 film Nongnu (also playing in this film festival). It more closely resembles the deeply sentimental work of China’s Fourth, and occasionally Fifth, Generation film directors. By the time of the film’s release, Chinese filmmakers were more likely to romanticize life on the plateau than to condemn class criminals in their films. Xie’s Tibetan peasants sing as they thresh wheat and his lamas act with compassion in stark contrast with the miserable serfs and gun-toting Buddhist fanatics of earlier depictions. Even the jealous Lhasa aristocrat Gongsa, Gyatso’s main rival, exudes humanity. The director also portrays present-day Tibet as the object of international fascination it has become: at one point the camera zooms in on a foreign tourist with a telephoto lens, and a major character just happens to be a multilingual tour guide for the Tibet Museum. The Potala Palace, now a museum itself, seems to loom over nearly every scene set in Lhasa. One gets the sense that Yeshe Drolma herself is a living relic from a bygone age whose story must be told while there is still time. Mainstream Chinese culture is nowhere and everywhere in her love story: over the previous decades the song, dance, chivalry and uninhibited romance of China’s ethnic minorities have come to occupy an important space in the Chinese imagination. Meanwhile, the modern east-coast urbanite is represented by Dawa, whose crumbling relationship with her Chinese boyfriend Xing Xing stands in stark contrast to the undying love between Yeshe Drolma and Gyatso. Not much about young Dawa’s life is revealed, but what little there is points to the fact that two generations are enough to change social norms beyond recognition. 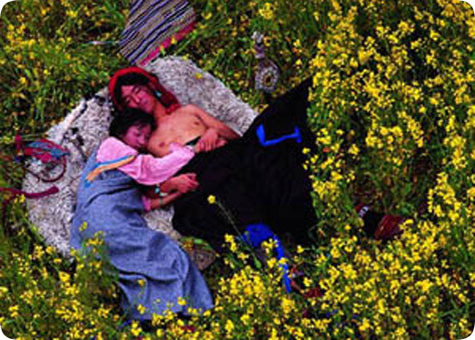 Song of Tibet is noteworthy for its prominent featuring of the role of religion in everyday life, even as it oversimplifies that relationship. We see lamas name Yeshe Drolma’s child, offer prayers for her dying husband and even care for her in her darkest hour. The director maintains neutrality over the 1959 uprising in Tibet; viewers should keep in mind that this is not a historical drama but a love story that more or less glosses over the major historical events of the decades in which it is set. Even so, it says volumes about what Tibet has become in the collective Chinese imagination. Song of Tibet is appropriate for middle school students and above. It is relevant for courses in Asian religions including Buddhism, gender relations, geography, world history and Chinese history and film. Mark Frank is a Ph.D. candidate in the East Asian Languages and Cultures Department at the University of Illinois.